Minister of Justice Katarina Barley (SPD) has said she wants to “prevent upload filters“, determined that Article 17 would lead to them and expressed regret at the outcome of the Parliament’s vote – and yet, she acts as if her hands are bound. 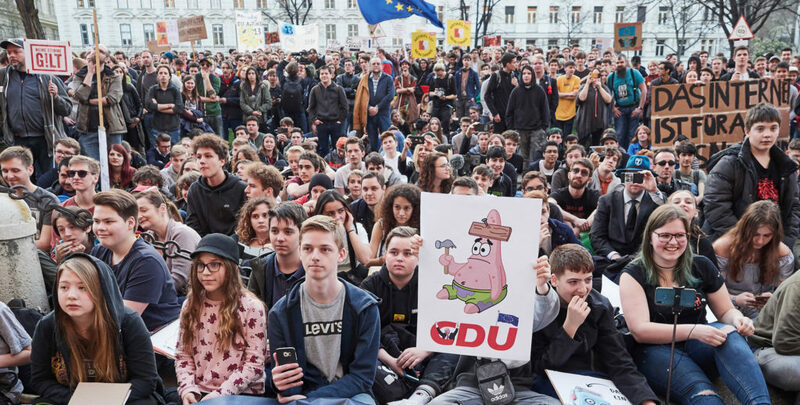 The CDU meanwhile tried to placate protesters by committing to implementing the law without upload filters – only to have their own EU Commissioner, who initiated the project in the first place, state right after the vote that this would be impossible. At the request of the opposition, the German Parliament will consider demanding that the government vote against the Directive in Council later tonight. Keeping up public pressure in Germany remains our best chance to stop the Directive. Another round of protests has already been announced for multiple cities this Saturday, April 6 – see SaveTheInternet.info for a list. In the United Kingdom, Conservative politician Boris Johnson has called the Copyright Directive “terrible for the internet”, claiming it was a “classic EU law” that the UK should not implement. Of course, he neglected to mention that 15 out of 19 of his party’s MEPs just voted in favour of it, and that the UK government could by itself still stop the project in Council. Helping the Directive pass and then blaming the EU for their own mistakes: That’s Brexit in a nutshell. In Sweden, where most MEPs voted against the law, efforts are underway in the national Parliament to force the government to vote against the Directive in Council – while Sweden alone will not make the difference, this is an important sign that things can still change. In February, the Directive was opposed by Italy, Poland, the Netherlands, Luxembourg and Finland. There’s a voting calculator tool on the Council website.